This Mountain Life....: March Snowstorm on the way! March Snowstorm on the way! March 5th: Happy day, happy Jay. 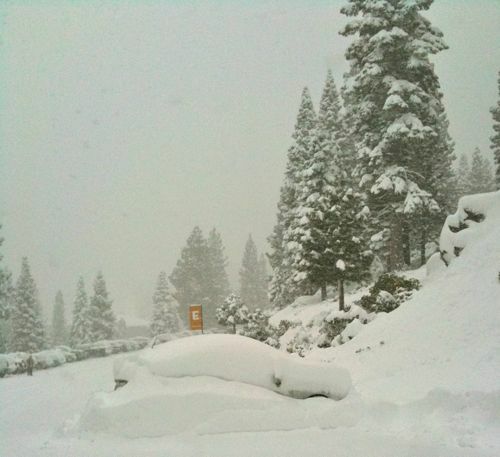 The snow is on it's way back to North Lake Tahoe with one to two feet possible tonight. "At least two waves of moisture driven by a cold low pressure system will cross the Sierra Tuesday and Wednesday, bringing at least a foot of now and possibly two feet to the higher elevations around Tahoe. Snow levels should begin around 5000 feet Tuesday afternoon and fall from there to below 3000 feet by Wednesday." So... if you haven't put your skis or your board away yet, come up this weekend! The picture below is from last year, but I'll post a similar one if Mother Nature dumps on us hard!